Walnut Report March 15, 2019 — Pacific Atlantic Crop Exchange, Inc. The walnut industry had strong very February 2019 up 35.9%. This is on top of the strong December 2018 shipments which were up 14.2% and January 2019 up 38.7%. The increase for the month was for both Domestic and Export sales and for Inshell which was up 100% and kernel which was up 22%. YTD Inshell to Turkey is 83.5MM up 17% vs. PY. YTD Inshell to UAE was 53.5MM up 113.8% vs PY. YTD inshell to Pakistan was 15.9MM up 735%. YTD shelled to Germany was 23.5MM still a disappointing 35.5% down. YTD kernel to Japan is down 21.6% and to Korea down 5.5%. YTD total inshell is up 12.9% and YTD kernel is up 5.8%. What do all of these numbers mean? 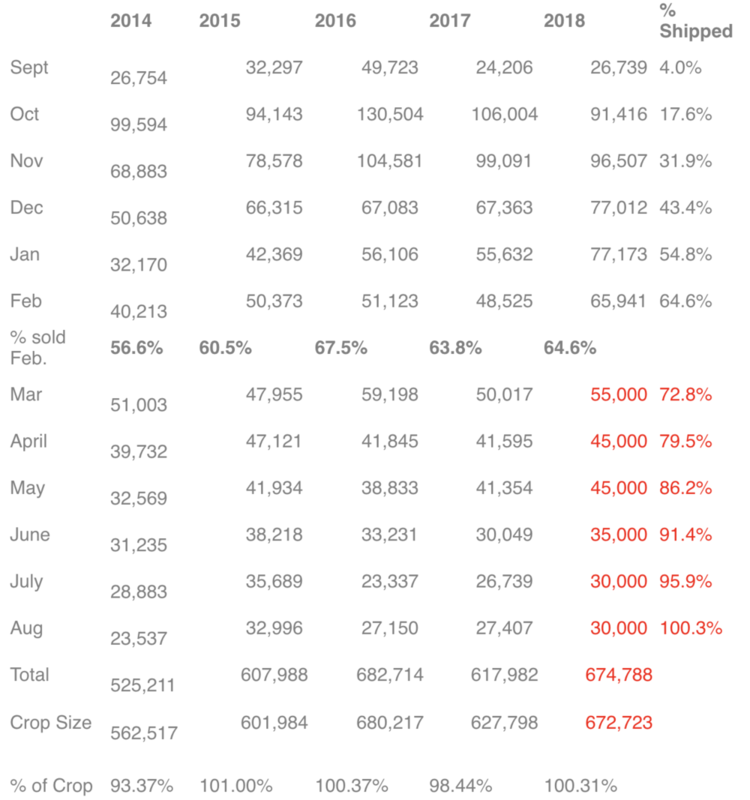 Please see table below of the past 4 years of actual shipments and YTD for the 2018 crop, crop size, and some moderate assumptions of what we could expect to sell the next 6 months. The chart above seems to suggest that for the next 6 months, March 2019 - August 2019, the industry needs to average 40,000 ton of sales each month to move 100.3% of the crop leaving only the 2018 "carry in" amount as the 2019 "carry out". This is not far-fetched to be able to accomplish this as this estimate is on a much cheaper pricing base than the prior year for the 2017-2018 crop. The industry is already 64.6% shipped and when commitments are tallied, the industry is most likely over 80% shipped and committed. The industry will be confident in its current position. Inshell Chandler (JL) 30mm+ is at $2.85-$2.90/kg CFR, Inshell Serr (JL) 30mm+: $2.75-$2.85kg CFR and 80% LHP at $7.80-$8.10/kg CFR. Serr harvest has started today and Chandler will start in 3 weeks time. Inshell Serr is well sold and difficult to find offers. Chandler shipments for the 1ST 4-6 weeks is sold out. We have seen strong inshell buying from traders Dubai while Turkey is waiting the for the harvest before continue their buying. California may get a boost in momentum from the Chilean price increases if buyers cannot wait until May and with buyers that don't want to pay the higher price. - Cold Storage - Each year Packers will want to move out goods rather than put them into cold storage which can be expensive. Expect some short term deals from Packers that don't have good cold storage or don't want to spend the money. - Pricing for walnut material is as follows: Domestic LHP $2.55 -$2.85/lb, Export quality 20% LHP $2.95 - $3.10/lb. CHP is in the $2.40/lb to $2.55/lb. Chandler Halves in the $3.30 to $3.50/lb range with very little material. Inshell Jumbo/Large Chandler $1.18 - $1.20/lb range with very little material available. Conclusion - There is a fairly large pricing spread in domestic light halves and pieces as we speak sparking some deals to be had. Chandler light halves and pieces pricing is fairly stable with a slightly tighter range due to lower Chandler inventory as a result of significant Chandler that went inshell to Turkey, UAE and Pakistan. The past three shipping months have been very strong and the industry is a bit embolden by those numbers. There will be some deals out there on domestic light halves and pieces and to some extent CHP as packers approach the cold storage season. At this point, California sees no reason to doubt that they can sell this year's crop.